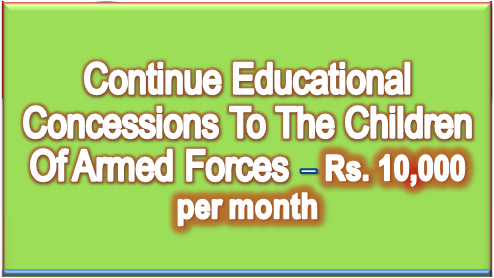 Continue Educational Concessions To The Children Of Armed Forces – Rs. 10,000 per month. Param News: Central Government Employee News|Latest DOPT OM: Continue Educational Concessions To The Children Of Armed Forces – Rs. 10,000 per month. Educational concessions to the children of Armed Forces Officers/Personnel Below Officer Ranks (PBORs)/Missing/Disabled/ Killed in Action without the cap of Rs. 10,000 per month.